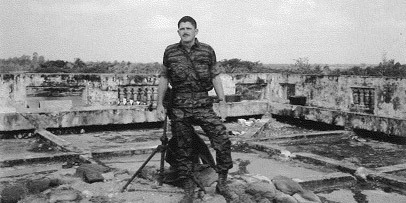 Mack Gwinn Jr's understanding of and appreciation for weapons began when he was a young Vietnam-era member of the Army's Special Forces recon team (RT). His small unit was frequently inserted by helicopter behind enemy lines where he and his men faced enemy opposition of platoon, company, and even regimental strength. The soldier, when not fighting for his life and that of his team members, constructively imagined what kind of weapon would best enable him and his team to complete their mission and to get to a landing zone for extraction. He dreamed of a more versatile, reliable, and lethal weapon with which to arm himself and his men for use in combat. The hard realities of jungle fighting and dying shaped Mack's future life's work. His insights and determination led to the development and perfection of revolutionary modular weapons for both the civilian and military markets. After he left the Special Forces, Mack Gwinn Jr. founded Gwinn Firearms, which later became Bushmaster Firearms in the early 1970s. After successfully designing and marketing the Bushmaster family of weapons, the company was sold, and today is one of the largest firearms manufacturers in the United States. Mack Gwinn Jr. went on to design the .50 Quick Change Barrel for Fabrique National, high capacity 75 and 90 round magazines for MWG Company, and the counter poise system with Jim Sullivan, who worked on the original Armalite design team in creating the first M16 rifles --- which became the most widely used rifle in today's military. Through the years, Mack's patented firearms inventions continued and he finally created the ultimate weapon, the HYDRA Carbine --- the weapon that he dreamed of as a young Special Forces soldier. Today, Mack Gwinn Jr's vision has become reality in the development and marketing of a new modular weapon platform --- the versatile and ever-dependable HYDRA. This next generation of weapons systems is one of the products that M G Industries, (MGI) sells today.